In the simplest of terms, the world is awash in too much debt. The bond bubble was close to $80 trillion in size going into 2008. The Central Banks had a choice to either let the defaults hit and clear out the garbage debt from the financial system or attempt to inflate the debts away. They chose to attempt to inflate the debts away. Put differently, all of their policies were aimed at containing debt deflation… or the process through which debt becomes less and less serviceable leading to eventual insolvency and default. Central Banks cut interest rates to zero to make bond payments smaller. Central Banks launched QE and other programs to put a floor beneath bond prices (when bond prices rise, bond yields fall and debt payments become smaller and easier to service). Central Banks provided verbal intervention promising to do “more” or “whatever it takes” whenever bonds came close to ending their bull market. As a result of this, the financial system has become even more leveraged than it was in 2007 at the beginning of the last debt crisis. Globally the bond bubble has grown by more than $20 trillion since 2008. Today it is north of $100 trillion, with an additional $555+ trillion in derivatives trading based on it. Yes, $555 TRILLION, more than seven times global GDP, and more than 10 times the Credit Default Swap market ($50 trillion), which triggered the 2008 Crisis. By not allowing the bad debts to clear in 2008, the Central Banks conditioned everyone from consumers to corporations to believe that business cycles could be contained and that the bond bubble/ bull market had not ended. As a result of this, TRILLIONS of dollars of capital have been misallocated. The evidence is everywhere you look. 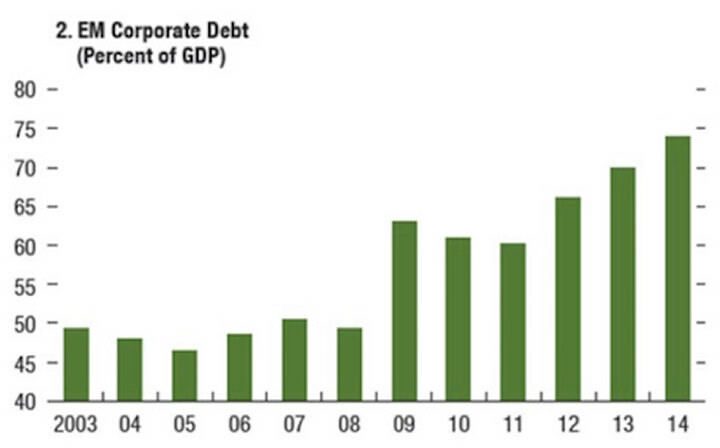 Corporates around the globe have been issuing record amounts of debt, much of it in US Dollars. Chinese firms might be the most out of control when it comes to bond issuance, but they are hardly unique. As the below chart reveals, the pace of corporate debt issuance in Emerging Markets worldwide has been extraordinary relative to economic growth. Today, the Emerging Market corporate bond market is equal to nearly 75% of total Emerging Market GDP. It was at just 50% in 2007 during the last peak! This has also been the case in the US where corporates have posted four straight years of record bond issuance. Moreover, most of US corporate bond issuance is going towards stock buybacks and financial engineering (massaging results to look better than they are) NOT legitimate expansion. As a result of this, the financial system today is even more leveraged with more garbage debt than it was going into 2008. Another Crisis is coming. Smart investors are preparing now. To whit, we just closed out two new double digit winners yesterday, bringing us to 40 straight winning trades over the last 12 months. That correct, during the last year, we’ve not closed a SINGLE LOSER. And if you go back further, 46 of our last 47 trades have made money. In fact, I’m so confident in my ability to pick winning investments that I’ll give you 30 days to try out Private Wealth Advisory for just 98 CENTS. During that time, you’ll receive over 50 pages of content… along with investment ideas that will help make you money… ideas you won’t hear about anywhere else. If you have not seen significant returns from Private Wealth Advisory during those 30 day, just drop us a line and we’ll cancel your subscription with no additional charges. © 2015 Copyright Graham Summers - All Rights Reserved Disclaimer: The above is a matter of opinion provided for general information purposes only and is not intended as investment advice. Information and analysis above are derived from sources and utilising methods believed to be reliable, but we cannot accept responsibility for any losses you may incur as a result of this analysis. Individuals should consult with their personal financial advisors.